Hello folks! Today we'll be taking a closer look on one of the newer cases from Antec, the PlusView 1000 AMG case. 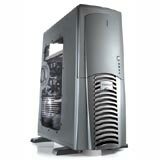 Antec is well known for its excellent cases in the past, So how about this case? Will this case be able to fit in Antecs line of high quality cases or is it a complete mistake? We'll see so read on! 20.6" x 8.1" x 18.6"
* External: 4 x 5.25", 2x 3.5"
* Internal: 4 x 3.5"
That were a lot of specifications, now lets get on to the actual review. what pictures are these ? you don't have a blitz ?? thermaltake, raidmax, koolance buy the right to use the design of this tower! bouahhhh! major flaw is the offset front fans behind the bezel, as I found out!! There's another negative point and that is that the lower 3.5 drivecage has a fan. Because this fan is placed in this drivecage the harddrives placed in this cage are pulling out more then the upper 3,5 drive cage. Right sidepanel : remove the screws and slide it out. Front panel : Inside your case on left and right side of the front panel are 3 grey plastic clips, push them in and you should be able to take of the front panel. Very nice review with plenty of pic's and all. But how did you guys get the front and the right side of the rig? I'm asking becouse i have the exact same rig but i don't no how I take the front and right side off?